Our Main Gate is currently out of action so visitors should enter through the South Gate. 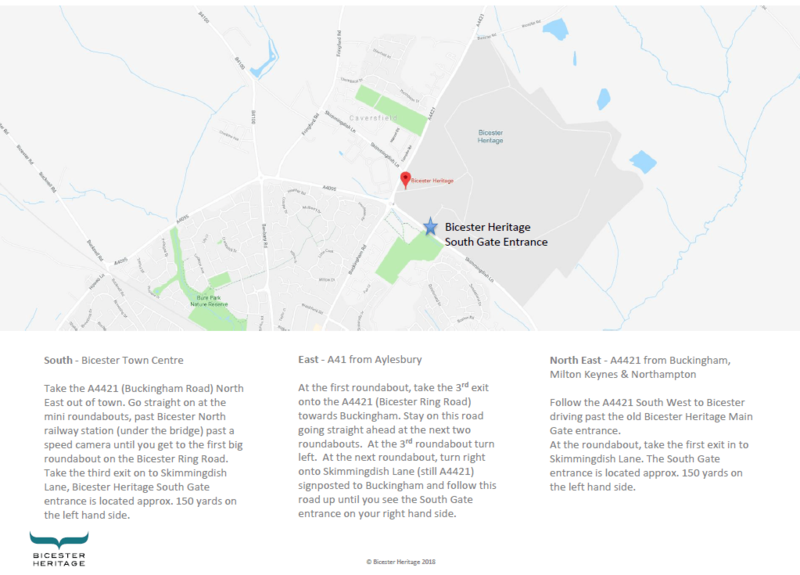 Please enter the below post code in to your satellite navigation, which will bring you to our temporary South Gate Entrance on Skimmingdish Lane. Once at the South Gate location, please press ‘22’ followed by the call button and they will activate the barrier remotely. Once the barrier is open, you will need to drive past Hangar 137 (on your left) and head straight on towards the Tanker Sheds where you reach another gate – the Specialist will pass you the code for the gate over the phone once you arrive at the barrier. Please note that aircrafts have the right of way over cars so please be vigilant of aircrafts crossing the road to access the airfield from Hangar 137. If the specialist is unavailable to open the barrier for you, please press F1 to cancel the call and redial the ‘Bicester Heritage’ button No.1 followed by the call button and they will activate the barrier remotely and pass you the code for the second gate. Please give us a ring with any questions – +44 (0) 1235 426251.